Learn from the best! In this article, I dissect the secret techniques of the Aeropress World Champions. The Aeropress has gone from being an obscure coffee brewing contraption to a cultural institution in just a few years. Today there are national and international championships, countless of crowdsourced recipes, and even viral phenomena like the #milehighaeropressclub (check it out on Instagram, if you want to see how creative coffee people can be). But there’s also a dark side to the Aeropress… one you usually don’t hear about in the glossy barista magazines. The truth is that a lot of amateurs, as well as professionals, couldn’t brew a proper Aeropress, even if their life depended on it. I have had quite a few friends confess to me that the brewer ‘just didn’t do it’ for them. And to be honest, I’ve even been there myself. The Aeropress can be used in a multitude of ways. But that also means that you can mess it up in even more ways. In this article, I’ll zoom in on every little detail of this fascinating brewing device — from the history to the latest trends at the World Championship as well as advanced Aeropress instructions. I will also give you my take on the five most common brewing errors. If this article had been published 150 years ago, it should probably have been called a ‘treatise’ or something grandiose like that. But since we live in the postmodern internet world, I’m just gonna call it the ‘Ultimate Advanced Guide’. As such, it’s not meant to be digested in one sitting, so you might want to bookmark it and return when you’re thirsty for more caffeinated knowledge. Enjoy! Like most awesome things in the world, the Aeropress started out as a slightly crazy idea inside the head of an unusual man. Alan Adler, an inventor, and mechanical engineer didn’t set out to create a commercial product. Rather, he was just looking for a way to simplify coffee brewing. Before then Adler’s main claim to fame was that he had invented the ‘Aerobie’ – a revolutionary kind of flying disc that could be thrown much farther than a traditional frisbee. But in 2003 Adler began experimenting with coffee brewing. One of the first things he started to look into was water temperature. Adler preferred coffee brewed with a temperature around 175°F/80°C and so did most of his subject. This goes against a lot of traditional coffee wisdom, where the water is closer to a boil. At that time Adler was doing pour overs and he realized that there might also be something gained if the brewing could be speeded up using air pressure. 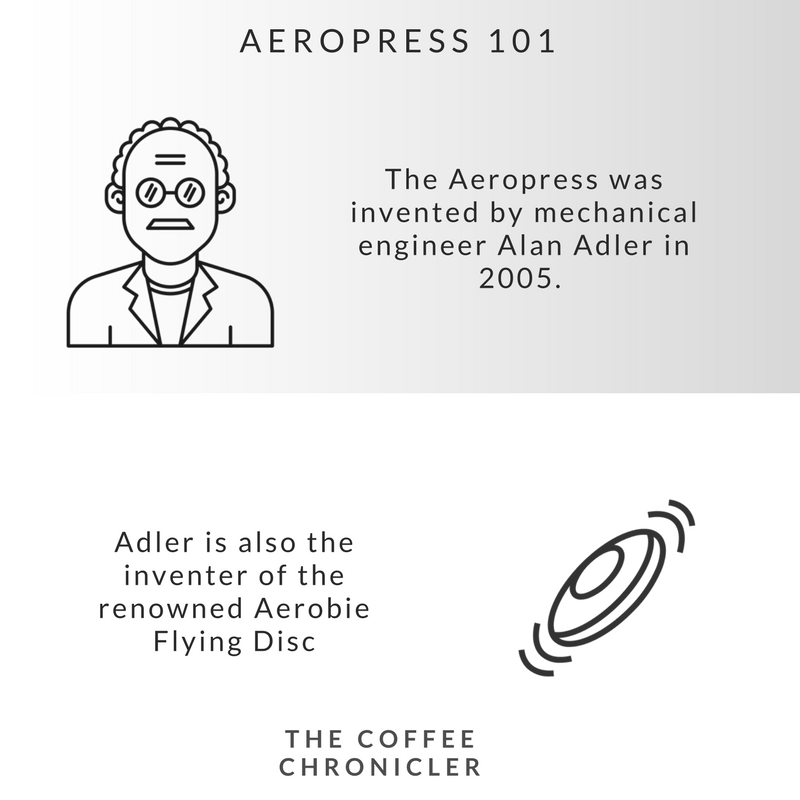 Adler made a crude prototype of the Aeropress and invited the general manager at his company Aerobie to have a sip. “Alan, we can sell millions of these”, he blurted out upon tasting the brew. It took another two years before the product hit the market in 2005. But since then the direction has only gone one way for the Aeropress. The first international championship took place in 2008. Not because Adler and his company created it, but because the coffee community was so enamored with the little brewing device. Norwegian coffee-star Tim Wendelboe is often credited as one of the main initiators. At age 78, Adler decided that it was time to retire. In 2017 he sold off the toy making division of Aerobie. The coffee department is still waiting to be acquired. During the years the brewer has undergone small tweaks and improvements. The Aeropress was Alan Adler’s way of being able to control more of the parameters compared to using an espresso machine. But in fact, he created a brewing device with more options than any other out there. You can literally do everything with an Aeropress. Let’s take a look at some of the more common techniques. The first big question you have to ask yourself when brewing on the Aeropress is if you wanna brew like Alan Adler intended or you wanna go ‘inverted’ aka upside-down. The people in the inverted camp believe that it offers better control over the extraction since no coffee is allowed to drip out. Of course it also looks pretty darn cool, when a barista flips over the brewer. Not everybody is convinced, though. Some people don’t like the idea of the coffee resting on the rubber gasket and think it could impart a bad flavor to the coffee. Brewing temperature is another interesting variable to play with. Alan Adler prescribed 175°F as his ideal temperature, but this goes against mainstream coffee brewing dogma. For years 200°F has been seen as the ideal – and it still is when it comes to brewing espresso or pour over. 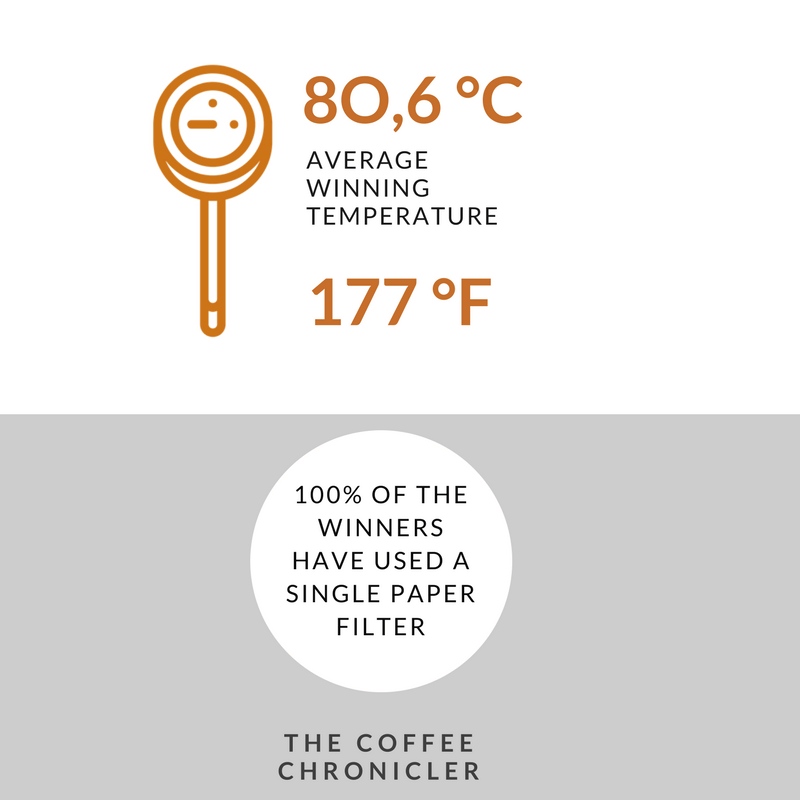 Among Aeropress aficionados however, it is common to brew at rather low temperatures. 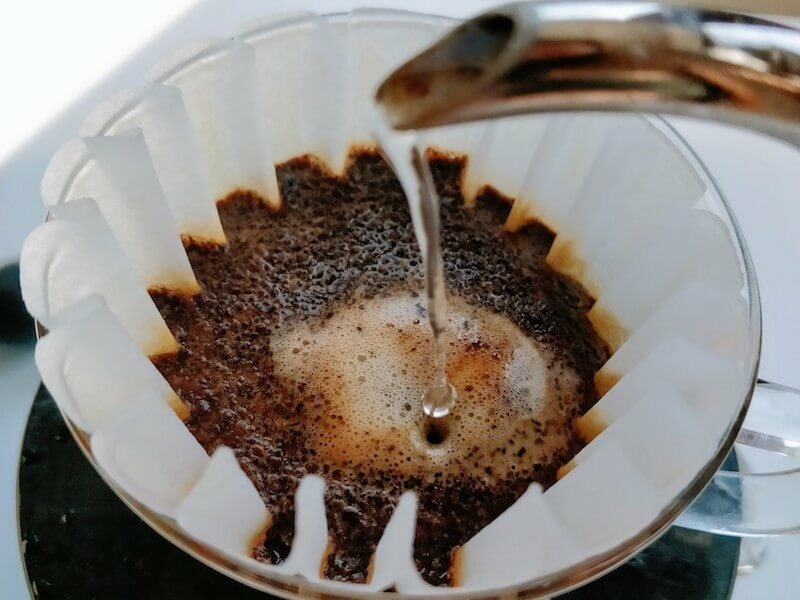 Blooming is originally a technique from the pour over method. Blooming is especially important with freshly roasted beans. It means that you add a tiny amount of water, just enough to saturate the grounds, to help the beans get rid of trapped carbon dioxide before the real brewing begins. Usually you’d add double go for a water to bean ratio of 2:1. Then you wait for 25 to 45 seconds to let the beans get rid of any trapped carbon dioxide and start brewing. 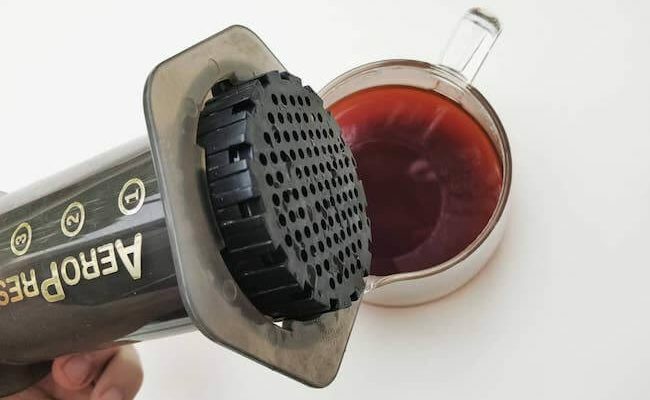 With the Aeropress it’s common to see recipes that call for dilution – you brew an ultra strong beverage and then mix it with up to 50 percent hot water. Dilution is not a totally uncommon technique in the world of coffee. When you think about it, this is exactly what happens when making an Americano or Latte. Still, in manual coffee brewing it’s usually not applied. When the water is around the ‘1 mark’ you finish the brew instead of pressing all the way through. This technique is quite unique to Aeropress brewing and today it’s considered best practice. The idea is that you don’t press the plunger all the way to the bottom. Instead you finish the brew before and discard the slurry with some of the brew water left. A lot of aero-baristas like to stop right when they hear a ‘hissing’ sound, others may use visual cues. The idea is that by pressing the coffee puck and the last brew water you may extract a lot of unwanted molecules. By not including it in the final brew you can avoid bitterness or off-flavors. The World Aeropress Championship (WAC) was held for the first time in 2008 in Oslo, Norway. Coffee experts Tim Wendelboe and Tim Varney (who worked with Wendelboe back then) thought it would be a fun thing to organise. And so they did. Only three competitors showed up and no records were kept about recipes and so on. Norwegian Anders Valde won, and that’s all we know today, really. In 2009 Varney contacted Aerobie to have them manufacture a special trophy for the winner. 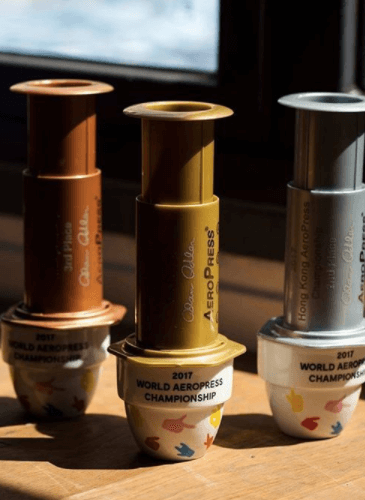 They sent back the bronze, silver and golden Aeropresses that are now a mainstay in the WAC (source). In 2010 national competitions had started to pop up spontaneously. That year the WAC was held the same time as the Specialty Coffee Association of Europe’s World Coffee Event in London. Ever since then the WAC has taken place concurrent with a major international coffee event. While the WAC is more down-to-earth compared to the World Barista Championship, it’s still fiercely competitive. Today, all the competitors have to qualify by winning the national championship to even enter the WAC. This means that we can actually learn quite a lot by studying the champions and their recipes. And in fact, quite a few new techniques have been introduced on the world stage at these competitions. So what does it take to make Aeropress like the champions? Read on to find out. One of the most important things when brewing any kind of coffee is the so-called brew ratio. The brew ratio is the relationship between the amount of coffee and water used. 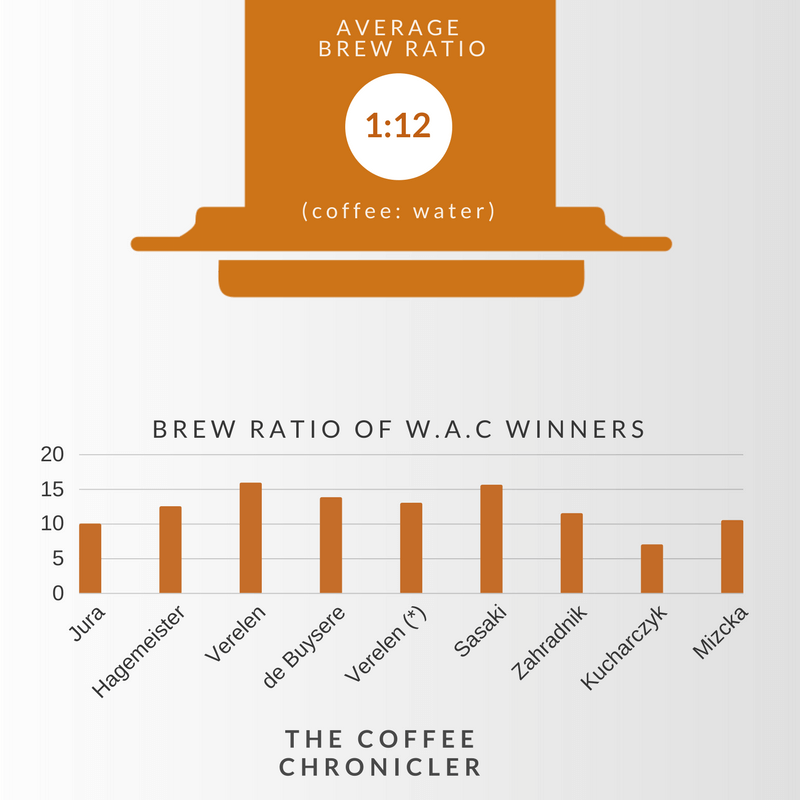 So a 1:18 brew ratio, for example, would mean that for every unit of coffee you’d have 18 units of water. This particular ratio is what the SCA calls the ‘Golden Cup Ratio’ (source). Personally, I find this ratio to be a bit thin when brewing pour over, so instead, I’d usually opt for around 1: 15. However, with most brew methods (excluding espresso) you’ll see that the vast majority of the recipes suggest between 1:15 and 1:18. On average the ratio is 1:12. 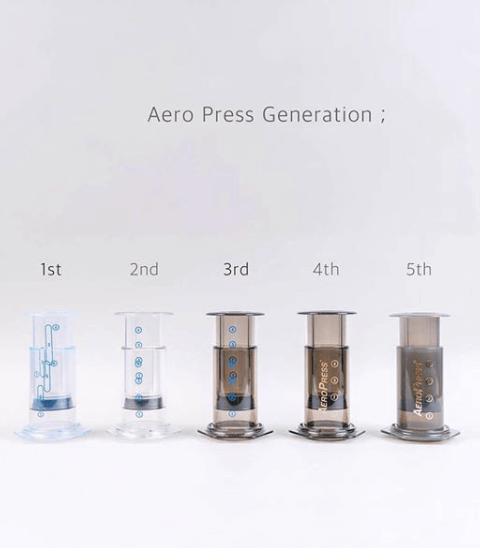 This definitely suggests that the Aeropress should be treated quite differently compared to all other manual brewing methods. Another pattern that jumps out immediately when studying all the past champions is that the water temperature is rather low. On average the winning temperature is 177 °F. For years the official recommendation from the SCAA has been 200 °F (source). There are different theories as to why a lower temperature might be better. One states that certain compounds extract at around 177 °F, while more bitter and less desirable ones extract closer to a boil. A very simple and down to earth explanation however, is that using a low temperature makes it possible to enjoy the cup sooner rather than later. On the other hand, the respected coffee innovator and former World Brewers Cup winner Matt Perger has long been an advocate of using boiling water. His argument is that this ensures the best possible extraction. It’s also very easy and consistent to do every time, compared to using a thermometer. Simply, you won’t burn your tongue. This allows you to enjoy more of the volatile aroma compounds that might otherwise evaporate (source). But overall, we will have to say that the jury is still out on the perfect water temperature. There is plenty of anecdotal evidence pointing to everything from 175- 205 °F. In the end, it’s probably more down to personal taste than anything else. “Initially, the way to get to the recipe was classic trial and error. Kaizen way of improvement: Every morning 2 Aeropresses, 1 ‘best’ method a standard, and 1 challenging method, if the challenging method was better than that one would be the next days ‘’best’’ method. There are many variables to play with to make a challenging method: grind, ratio, water, temperature, time. One caveat that I should maybe add, is that the low temperature at the WAC should also be seen in the light of the unusually high brew ratios. It’s likely that these two parameters should go hand in hand. One of the interesting things about the Aeropress is that it offers the users to change and tweak many small things. For instance, there are quite a few companies that produce special filters made out of different metals. Some people also like to experiment with using two paper filters for extra cup clarity. But in fact, every single winner of the WAC have opted for a single, traditional paper filter. When it comes to the position of the brewer, it’s hard to make any firm conclusions. The first two winners used the inverted method, then followed four consecutive upright champions, and now the last three have been inverted. What makes the Aeropress so cool is that it’s half brewing device, half toy. in this section, I’ll introduce you to a few cool ways to get more out of the Aeropress. These might not be award-winning recipes, but they’ll get reactions on Instagram. Have you ever tried making cold brew with a normal pour over filter? No? Well, I’ll save you for a lot of trouble and tell you to not even try it! 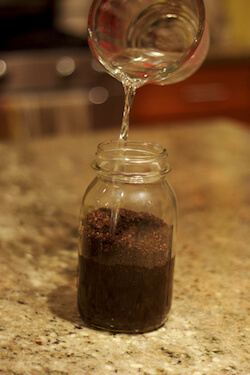 When making cold brew, water and coffee grounds are usually in contact for 12 to 36 hours. This gives the fines plenty of time to soak up water. That’s why it’s so hard to pass through a filter. If you pour it into a V60 it’ll clog almost instantly. That’s why the Aeropress is a lifesaver, when it comes to cold brew. Because of the air pressure you can actually filter it pretty easily, leaving you with a nice and balanced cold brew in no time. Add 35 grams of coffee to 500 grams of water in a bottle. Leave on the counter top for 5-10 hours. Pour the slurry into an ‘upright’ aeropress. (You can use either a paper or metal filter, depending on your preference). Plunge over ice cubes. (Rinse and repeat, if you have more mixture left). You like ice coffee but think that cold brew is often too flat and dull? Then look no further than the cold drip! This brewing method actually extracts the coffee quite differently compared to its more well-known cousin. For years, the main problem has just been that the equipment to make a good cold drip has been both incredibly expensive and bulky. Who wants a giant piece of equipment that looks like something from a steampunk lab on their countertop? My guess is nobody. 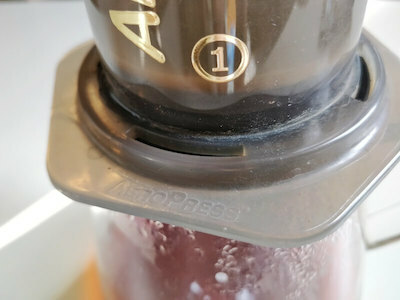 Luckily, a new Kickstarter product named “Puckpuck” created an intelligent little cap that turns the Aeropress into a cold drip tower. The process might seem a little bit complicated at first, but just follow the procedure step-by-step and you should be able to get a good result within a couple of hours. Add the coffee to the Aeropress. Cut the bottom of a plastic bottle and attach it to the Puckpuck cap. Adjust the driprate of the device to around 50 drops per minute. The cold-drip should be finished in around 2,5 hours. 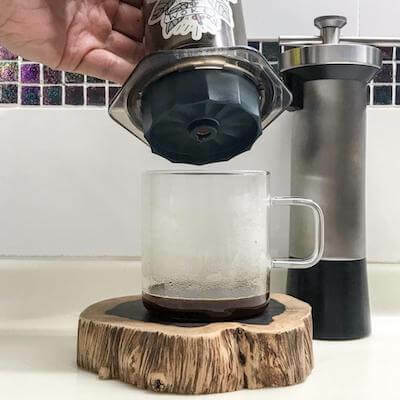 Even though Aeropress today is widely considered a black coffee brewing device – comparable to the French press or the pour over – there has always been an aura of espresso somewhere in the mix too. The connection between the espresso and the Aeropress at first glance seems obvious. Both devices utilize pressure. 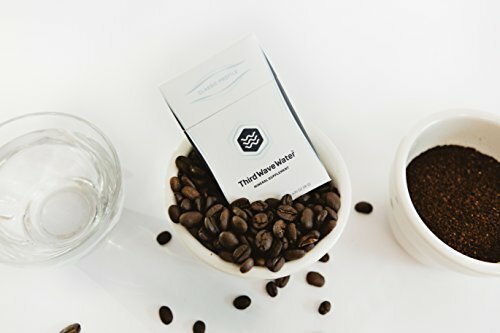 But while the 9 bar pressure is actually an essential part of the espresso brewing, the pressure of the Aeropress is merely a way to separate brewed coffee and the remaining grounds. So the pressure doesn’t play a central role in the extraction process. This is exemplified when Aero-baristas discard the slurry instead of pressing all the way through. What they are doing is actually the opposite of applying pressure. With that being said, Aeropress might make a comeback as an espresso brewing device. The Californian brand Fellow has released an attachment specifically designed for brewing ‘aeropresso’. The new contraption is called the ‘Prismo’. This little cap can be screwed on instead of the filter cap. It has a pressure actuated valve and an etched metal filter like a real portafilter. I have yet to try the Prismo, so I asked one of the most knowledgeable home baristas that I know; Alvin Cheng. 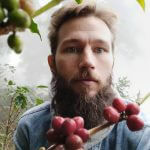 I specifically asked him to compare a prismo’d Aeropress to the Cafflano Kompresso – a diminutive manual espresso maker that is rapidly gaining momentum in the specialty coffee world. 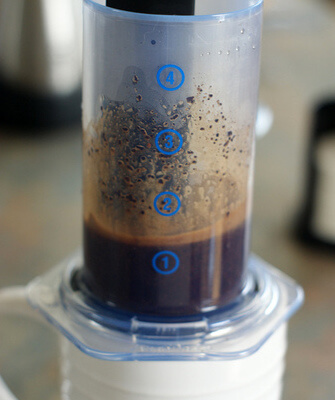 If you already own an Aeropress, the Fellow Prismo attachment is a natural choice for making “espresso like” shots. Well, minus the crema. It relies on high temperature, lots of agitation and some pressure to produce a drink very close to an espresso. Instructions and procedures are fairly easy, allowing better chances of producing good, drinkable shots. Meanwhile, the Cafflano Kompresso is a fully manual espresso maker that actually makes espresso with crema. It is small and portable enough that you can bring it just about anywhere. Getting a proper espresso shot takes practice and dialing in, just like a real espresso machine. For a quick and easy shot, the Prismo would be my choice. But for a more involved experience of making and tasting a genuine espresso, I would pick the Kompresso. Oldschool Aero-brewing has always advocated short brew times. But what if I told you that you can actually break the rules and get great coffee while doing it? I call this way of brewing ‘the long brew’ and the approach is closer to cupping rather than normal Aeropress-brewing. There are several reasons I like the long and slow brew. First of all, it can really bring out some unexpected and tasty flavors. Especially with beans that for some reason lack sweetness. Some aroma compounds take longer time to extract, so by increasing the brew time you get more body and more caramelized sugars. Another benefit of this recipe is that you can increase your brew ratio up to 1:18. 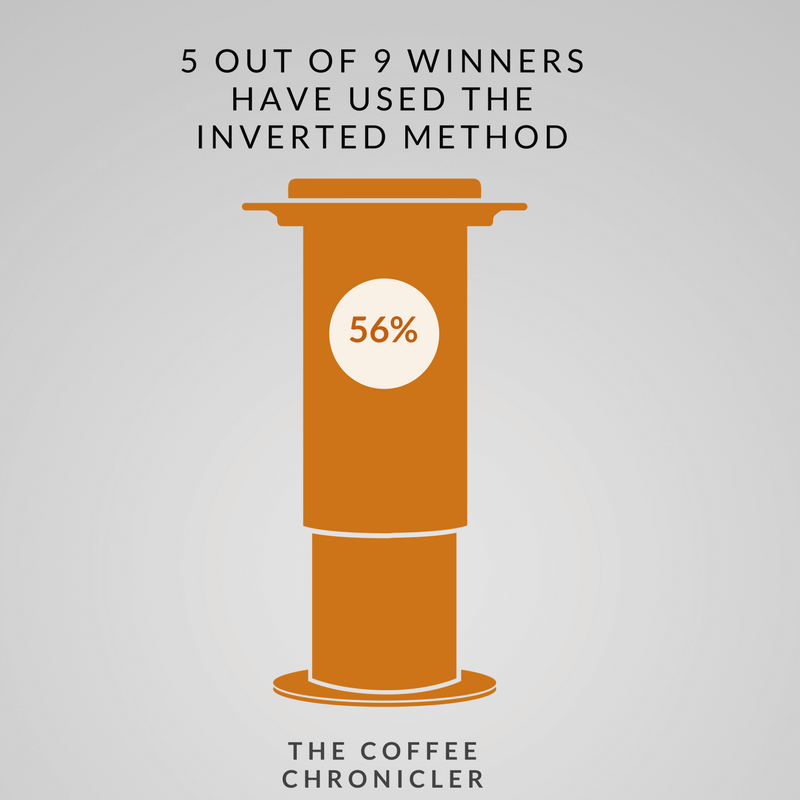 This means that you get the same amount of brewed coffee using fewer beans. So it’s actually less wasteful and at the same time you save a bit of cash. What’s not to like? Put you aeropress in the inverted position and put 14 grams of freshly ground coffee in the chamber. Slowly pour 250 grams of 200 °F water. Rinse paper filter and put it in the cap. Attach the cap and wait four minutes. When the four minutes are over stir 5 times, and let the crust break. Put cap back on. Wait 8 minutes. Invert and plunge slowly. As mentioned in the introduction the Aeropress has found a very unexpected fan base: frequent travelers with a penchant for coffee! This group is called the #milehighaeropressclub on Instagram. Initially, the idea was to brew your own on the plane instead of succumbing to horrible airline coffee. But gradually it has become a ‘thing.’ Slightly more awesome than the ice bucket challenge but not as cool as running with the bulls in Pamplona. You can’t really give a recipe for aeropressing on a plane. It’s more like you need the right mindset and a bit of guidance. Just have your equipment ready in your hand luggage, so it’s easy to get out once you’re in the air. Ask the cabin crew for cup of hot water. Usually, they will give you one for free. Remember, that you will have to brew inverted since you have to press into the same cup that your water is served in. I have tried it a few times, and it’s easier than V60’ing on a plane. Still, it’s a bit of hassle, and you are sure to get some weird looks. So far we have been talking a lot about the upsides of this remarkable brewer. Now, let me focus on some of the cons. 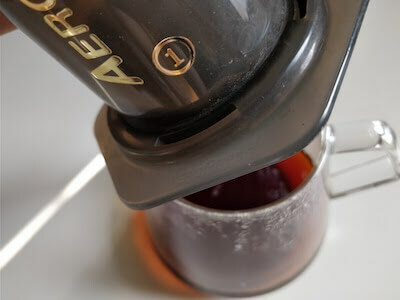 As mentioned in the introduction a lot of home baristas (as well as pros) actually have a hard time getting delicious coffee out of the Aeropress. I have often had friends confess to me that they rarely use the brewer and that pour over seems to perform better consistently. With that in mind, here are some typical mistakes the burgeoning Aero-barista might commit and how to fix them. 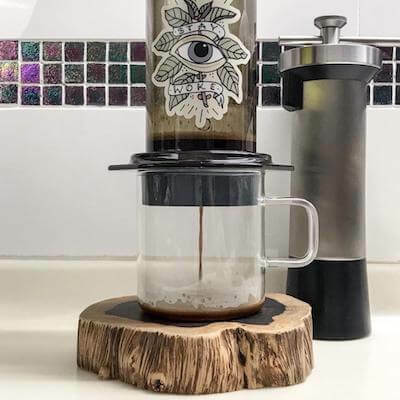 As mentioned above the Aeropress and the espresso has always had some kind of mythical connection in peoples mind. Maybe because of the names, perhaps because they both utilize pressure in some way instead of just plain old gravity. Anyway, it seems that a lot of home baristas think that it’s key to generate pressure when plunging. For that reason they will usually pump like madmen, almost jumping on the plunger to create an espresso-like 9 bar pressure. The truth is that this approach only serves to ruin your brew. Coffee brewed this way often has a weird, almost one-dimensional flavor. What you should do instead, is to put gentle pressure on the plunger. My results are often best when it takes between 1 and 2 minutes to press to the bottom. This tip might sound simple, but it’s a crucial step in making a delicious cup every single time. If you’re pressing the Aero directly into a preheated mug, a lot of things can and will go wrong. Black coffee should be brewed around 200 °F (93 °C), but it should be served and consumed around 140 °F (55 °C). Furthermore, it should be mixed and aerated slightly to let all the aroma compounds blend nicely. All the above things will happen automatically if you brew into a carafe or range server and swirl it around a couple of times. On the other hand, if you brew into a pre-heated mug, like a lot of wanna-be baristas tend to do, then your brew will be subpar. It will be way too hot to drink right away. And most of the aroma compounds will float around in the bottom of the cup. 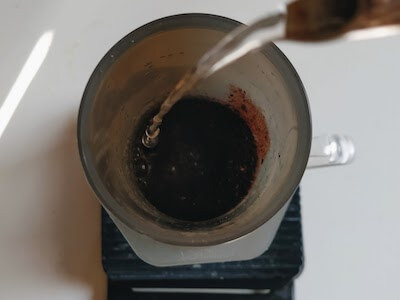 It’s a little bit controversial, but some of the most knowledgeable people in the coffee business also claim that coffee should be aerated to live up to its full potential. Almost like wine. In my opinion, aeration is a crucial step of manual brewing. A lot can be said about water and coffee. There are even books and scientific papers dedicated to this topic. Water is what often separates a good cup of home-brewed coffee from a world-class cup one in a third wave coffee shop. This is one of the most challenging parts to get right, though. On the surface, all water pretty much looks the same. So you need knowledge or perhaps even special equipment to get it right. If you want to know more about this topic, I suggest that you check out this article. But for now let me give you some brief advice: Avoid tap water. Most people on this planet, don’t have tap water suitable for coffee brewing. (This is true even if the water tastes good). Instead, use a relatively soft water like Volvic or use reverse osmosis water in conjunction with added minerals from the company Third Wave Water. Ideally, you want to use water that has a TDS between 70 and 140 with equal amounts of calcium and magnesium. If you want to invest time and effort, try my recipe for perfect brew water. 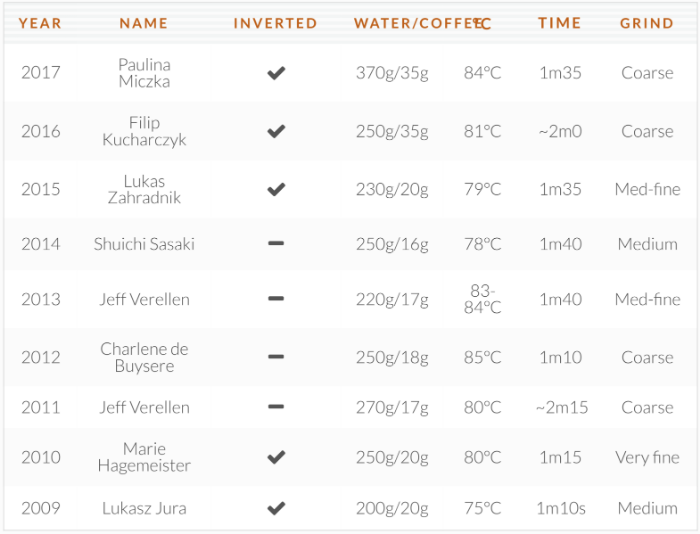 Brewing with a single filter isn’t really an error per se – after all, it’s what all the world champions do. Still, I have to say that I often get better results using two filters instead of a single one. If you’re into pour over like Hario V60 and Kalita Wave, then you should definitely try this little hack. It tends to make the cup clearer and more balanced, while also promoting acidity. Just put both filters into the cap, rinse, and brew like you’d normally do. If you want, you can wash the filters off after use and recycle up to 3 times. Just treat them as one entity, when washing and let them dry inside the filter cap to retain shape. This is another common error that is caused by old school Aero-propaganda. “This device doesn’t need cleaning – just press the plunger, and shoot the puck into a bin,” the instruction claims. Yeah, right – The Coffee Chronicler doesn’t quite agree. Let me tell you this frankly. If this is the only kind of cleaning you do, your coffee is going to taste awful within a month or two. Once in a while, give your brewer a nice bath in hot water and baking soda. Make sure to take off the rubber gasket too. It is removable, but many people have no clue. A lot of nasty oils will gather in the crevices if left to itself and that will impact the flavor. Don’t trust the sneaky coffee salesman on this one. It’s a cool brewer, but like all other items in your kitchen, it needs cleaning once in a while. If you have read all the way to the end, you already know a lot about this fantastic brewing device. I encourage you to experiment and test every little piece of advice. Keep what you like and discard the rest. 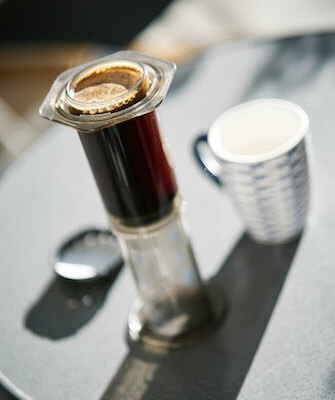 In the end, you can brew Aeropress in any way you like – the most important thing is that you enjoy it. The inventor of this brewer made toys before he got into coffee, with that in mind I think we should always focus on the playful aspect of the Aeropress.